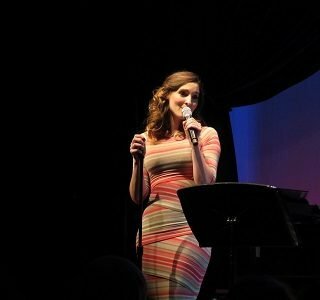 TR Robertson — The second show of the Club M cabaret season was the brainchild of Moonlight’s Managing Director and Club M Producer, Colleen Kollar Smith and the audience in attendance could not have been happier. The majority of the show presented couples, many of whom are Moonlight veterans, telling stories of how they met, how they have stayed together in the crazy world of the theatre, what it’s like to raise a family and singing songs that have meant something to them at different points of their lives. Moonlight’s Club M has become a popular beginning of the year event leading into Moonlight’s summer musical series. The 2019 Club M season is sponsored by Vista Energy Storage. Patrons for “Kiss & Tell” began to arrive shortly after 6:30 pm and were seated around specially designed coffee tables and were offered various appetizer selections to purchase, along with beer, wine and non-alcoholic beverages. Promptly at 7:30, Producing Artistic Director Steven Glaudini greeted everyone to the Kathy Brombacher Stage, named after former Moonlight Artistic Director Kathy Brombacher, who was in attendance. Steven told about the thinking behind the evening program, mentioned that he and his wife, Bets Malone, would be celebrating their 24th wedding anniversary in the coming week and introduced Bets via video. Bets is in Palm Springs performing in one of her favorite roles in “Honky Tonk Laundry”. She got the evening started singing “Hey There” to Steven and the audience. 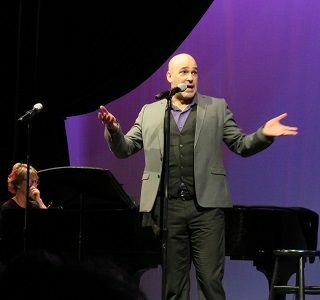 The evening’s performers included Bryan and Katie Banville, Nancy Snow Carr and husband Geno (who would join Nancy via video as he is currently performing on Broadway in the musical “Come From Away”), Charlie Gange and Katie Sapper (engaged), Kevin and Kyrsten Hafso-Koppman and Colleen and Lance Arthur Smith. Each couple spoke about the trials, tribulations and funny times they went through in meeting, falling in love and having kids. 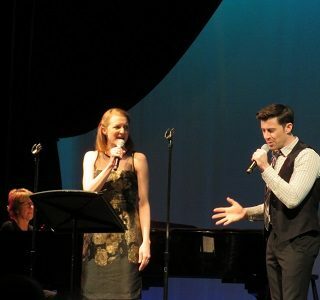 Each couple sang a variety of songs that was special to them for various reasons. 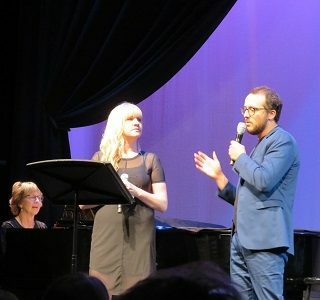 For example, Bryan Banville sang “Run Away With Me” which was part of his marriage proposal to Katie. 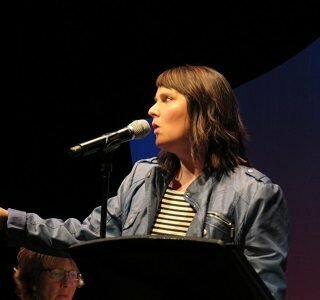 Kevin and Kyrsten Hafso-Koppman spoke about making the right choices in choosing a mate and sang “I Chose Right” from the musical “The Bridges of Madison County”. Lance Arthur Smith’s wonderful baritone voice was heard as he sang “So In Love” from the musical “Kiss Me, Kate”. 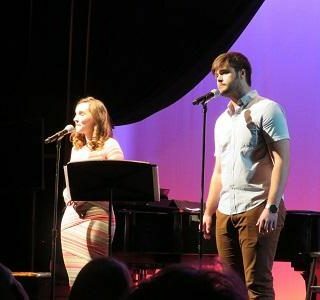 In the second half of the show Katie & Charlie sang the Oscar nominated love song from the 2018 version of “A Star is Born”, singing “Shallow”. Many more songs highlighted the evenings show. Piano accompaniment was provided by music director Elan McMahan. 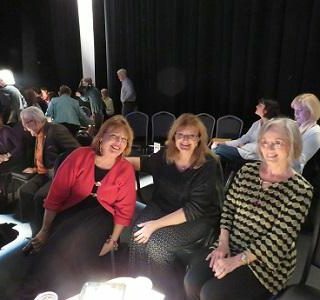 The evening was full of memories and insight into the life of couples in the crazy world of live theatre. It was not without funny moments. 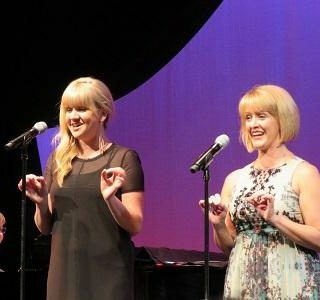 Nancy Carr and Kyrsten Hafso-Koppman teamed up on a funny “We Are Women” and the first half of the show ended with a rousing medley written and sung by Nancy Carr, as she went through her life meeting and being with Lance, especially travelling back and forth between the west and east coast over the years, including a reference to 23 pieces of IKEA furniture she put together by herself in NYC. 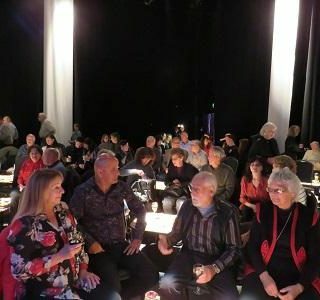 This Club M performance was a little different than most of the Club M shows, but it provided a different look at the actors and actresses that are seen on stage both at Moonlight and throughout San Diego County. Next up for Club M is Spencer Day: The Look of Love on February 16th. This event is close to a sell out so if you would like to attend, go to www.moonlightstage.com or call 760-724-2110.